When you ask students what they take away from classical mythology courses, their answers are often the same: the stories. Interpretations of the subject matter come and go, but the stories tend to stick with students long after the class has ended. 75 Classical Myths Condensed from their Primary Sources is designed to familiarize students with these stories in the most economical and accessible way possible. This text provides condensed versions of the essential myths and legends of the Greeks and Romans, as told by their primary sources. The streamlined stories, which retain much of the drama, irony, and pathos of the originals, include Homeric epics, Greek tragedies, Vergil’s Aeneid, the most famous episodes of Ovid’s Metamorphoses and Hesiod’s poems, and more. Based on their primary sources, the stories selected for this book are not adapted to or enmeshed in the author’s interpretation of them. 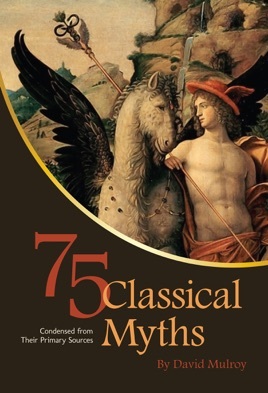 75 Classical Myths is an unpretentious work that fulfills a genuine need in a way that saves students both time and money. Students will acquire a foundation of familiarity with the whole range of classical Greek and Roman myths and legends with relative ease.